Here comes the very important conference in the upcoming September. We would like to invite all of you to come to Booth No. 28 to meet with us at the 11th International Conference on Geosynthetics in Seoul, Korea; in the meantime, we will present our paper “Sustainable Rehabilitation of a Highway Slope Failure with Geosynthetics” at the conference as well. If you are interested in this conference and our paper, please come to visit us, and have more discussion with us face to face! Visit ACE Geosynthetics at Geo-Congress 2019 in Philadelphia, Pennsylvania! 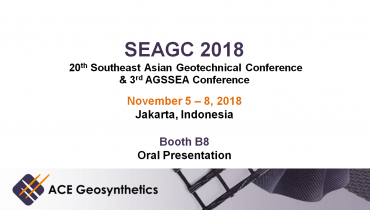 Meet ACE Geosynthetics at SEAGC 2018 in Jakarta, Indonesia! 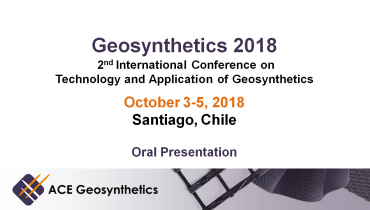 Meet ACE Geosynthetics at Geosynthetics 2018 in Chile!